NTT DATA MSE Corporation will make a technical session and a demonstration at the Automotive Linux Summit (: ALS), which will be held from June. 20th, 2018 in Ariake, Tokyo, hosted by The Linux Foundation. In the technical session, Yasumitsu Takahashi, Deputy Manager of NTT DATA MSE Corporation will give a presentation on "Integration of AI engine into AGL, Effort for Functional Improvemen and Practical Verification for Continuous Improvement of Inference Accuracy for Edge AI". We will also exhibit two demonstration systems at our booth. Overview Integrated AI engine into AGL and developed the Handwritten Digit Recognition Application. Also, performed the following 2 verifications by using this application. Will present the knowledge based on them. Developed the mechanism to enable continuous improvement of inference accuracy for edge AI due to the following flows. These flows are actually demonstrated. 1. Upload the learning dataset from the edge device when the incorrectly data recognition is detected. 2. Perform the additional learning at PC for learning via cloud and build the new learning model. 3. Download the learning model and update it at the edge device. 4. Recognize the data, which is incorrectly recognized at the edge device, correctly. Figure 1. Overview of " Mechanism to enable continuous improvement of inference accuracy for edge AI "
Implemented Movie Playback application and Map application for SDL onto AGL. As a measure against driver distraction*1, contents on a display can be switched using vehicle data acquired via IVI system. Supported the commercial application " Spotify ". Possible to detect the location where the driver braked hard or turned the steering wheel suddenly based on vehicle data, and the place of incidence is appeared on the map. ■SDL application is a mobile application that runs on both Android™ and iOS™ and supports Movie Playback, Map Display and commercial application " Spotify ". 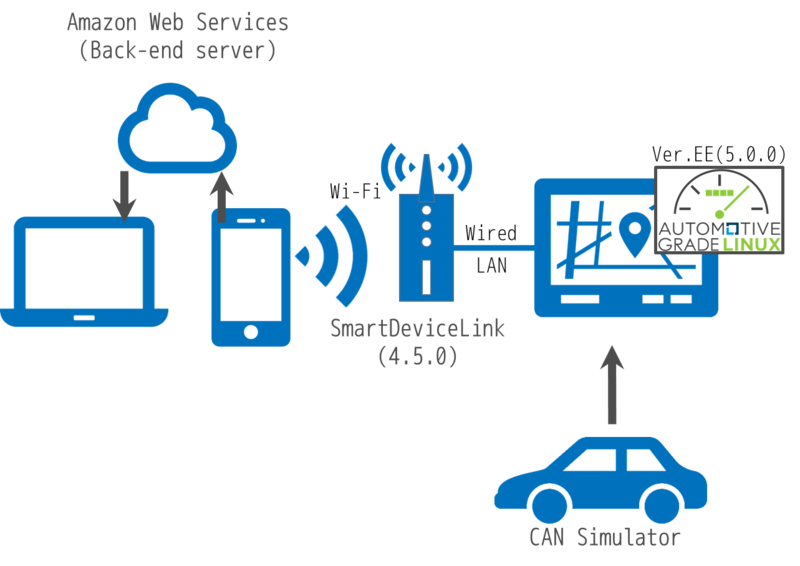 ■Vehicle data which is acquired with SDL is uploaded to the cloud (AWS) via a smartphone and that can be browsed using computers. ■As a measure against driver distraction, contents on a display are switched while driving according to the acquired vehicle data. ■When a sudden braking or a sudden steering is detected based on analyzing the vehicle data accumulated in the cloud, the place of incidence is displayed on the map. We will contribute to drive commercialization and practical realization of both AGL and SDL forward through organizing and performing collaboration with the other AGL related companies, function extension or new demonstration mainly on connectivity. * "Spotify" is a trademark of Spotify group.